"Authentic characters resonate throughout this engrossing novel. . . . Intensely real and deeply emotional, Duffy’s rich novel is worth savoring from the very first page." "Lisa Duffy’s latest novel, a story of joy and struggle in a coastal New England town, is full of engaging characters you’ll remember long after you turn the final page. This Is Home reveals the truth of human nature, which seeks to heal and forgive those we love, even when they break our hearts." 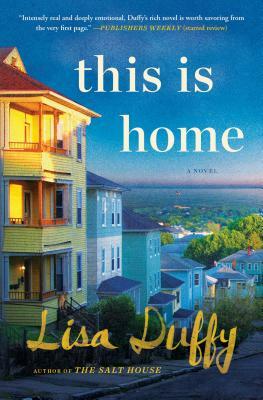 "Lisa Duffy’s beautiful novel delves into that most elemental of themes—home—with insight and grace. This is a book to savor." "This phenomenal novel reveals such unique and endearing characters struggling through upheaval and loss in order to forge the true shape of their family. They face each day with humor, grit, and vulnerability that draws the reader in. Libby, Quinn, Bent, and even the world’s smelliest dog rush to life on these pages and have carved out a place for themselves forever in my imagination. Building on her emotional debut novel, this book solidifies Duffy as a master of writing hope into heartbreak."